As a bootstrap startup, the low cost of entry to the AWS services made all the difference in the world. We've grown since then by adding over 80 staff and taking in over $20 million in venture capital, but it's still incredible how much infrastructure we get for so little cost. We're continually innovating and adding services for customers across the country with only two DevOps on staff. Kit Check helps hospital pharmacies improve operational efficiency, patient safety, and medication visibility by providing automated drug-tracking solutions. Its original Kit Check product uses a custom RFID reader, RFID tags attached to medication vials, and cloud services to help pharmacists and technicians check the contents and age of medications in kits that may contain up to 150 different drugs commonly used throughout hospitals. The solution cuts manual processing time to three minutes from 30 minutes, helping large hospitals cut labor costs by $180,000 annually or more. The Washington, D.C.–based startup also offers a similar solution designed for anesthesiologists in the operating room. Wanted to avoid IT complexity and expense and instead focus on getting product to market quickly. Had to control personnel costs, including the expense of an in-house database administrator. Needed a platform that supports compliance with federal Health Insurance Portability and Accountability Act (HIPAA) and other regulations. 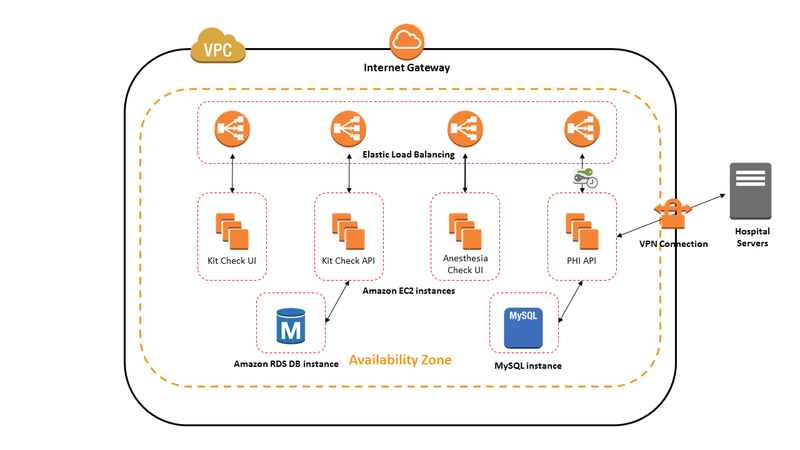 Started with Amazon Elastic Compute Cloud (Amazon EC2) and Amazon Relational Database Service (Amazon RDS) to launch Kit Check product. Slowly added additional Amazon Web Services as customer base grew to more than 200 hospitals. Uses Amazon RDS to manage information on more than 6 million tagged drugs. Low cost of entry with AWS enabled efficient product launch. Essential database services provided by Amazon RDS eliminated need to hire DB administrator at an annual salary of $175,000 or more. AWS has broad support for compliance measures, which opened talks with large prospective customers and provided a path for secure HIPAA compliance in the cloud. Read more about how AWS can help with your Internet of Things solutions.